Sweet and chewy on the outside, cold and creamy on the inside, adorable all over. Tint and flavor the mochi with the included matcha green tea and cocoa powder, or skip straight to mochi mastery by using jams or food coloring to make them more colorful. Purchase (or make) ice cream you love that complements those flavors. 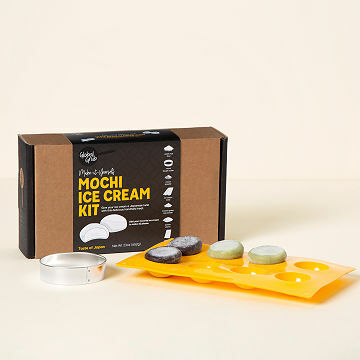 A fun weekend project or activity for a party, and no real cooking skills are required—just mochi motivation. Made in California. Makes up to 32 pieces. So, first off, we kind of had fun making this. The mochi dough is very, very, very sticky; so if you don't like sticky things, you will hate this. I'm glad it contains all the ingredients, unlike other kits where you have to buy the stuff and the food. We just had to buy the ice cream. I don't know if it's the type of ice cream we bought or our freezer, but our ice cream never froze solid; so we had some trouble getting it out of the molds. Additionally, the included ring to cut out circles didn't seem to be large enough to cover the ice cream pods, so ours ended up more like tacos. All in all, it was fun, tasted pretty good, just don't expect restaurant level quality. I think this is a cool idea. My daughter-in-law started making the first batch while we were there. They had homemade green tea ice cream so it was perfect to use for the mochi. The instructions seemed fairly complicated, but that didn't bother her. It's probably not something I would want to do. It may be one of those times that's fine to do once, but probably won't do again. Easy, tasty, and fun activity for the family! We made the mochi ice cream balls as a family - fun and easy. They are a great snack and gave everyone a quick activity to do together over the holidays. I gave this as a gift to my mom who is a chef and she loves it and may start making her own mochi in the future! This is perfect both as a gift for the creative chef and for use for parties, etc. This is a gift for my daughter who is obsessed with everything Japanese! Timely, well packaged, quality product.